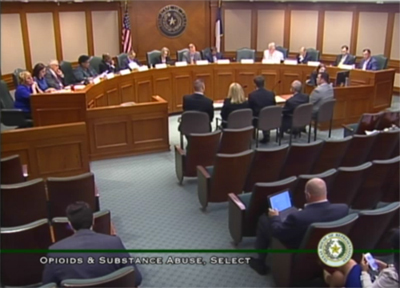 The Texas Pharmacy Association and other representatives of the pharmacy community testified Tuesday before the House Select Committee on Opioid and Substance Abuse. The committee’s third hearing focused on the prescription monitoring program and provided an opportunity for provider groups to share insights about the epidemic and possible solutions to address it. During the hearing, TPA’s Justin Hudman, division director of public affairs, testified before the committee on the importance of assuring that pharmacists have the proper authority to help address the opioid crisis and that payers need to recognize pharmacists as providers. In addition, Hudman testified on the need for the legislature to direct the Department of State Health Services to issue its own statewide standing order for Naloxone, authorizing all licensed pharmacists in the state to furnish Naloxone to any individual who may be at risk of an opioid overdose or any person in a position to help a person at risk. Hudman’s testimony, as well as remarks from other pharmacy organizations, was well received by the committee. Hudman closed his comments assuring the committee that pharmacy is strongly committed to working with the legislature to address the opioid crisis and substance abuse in our communities. TPA and other pharmacy organizations testify before the House Select Committee on Opioid and Substance Abuse. Click the image above and fast-forward to approximately 15:20 to watch the testimony. TPA 2018 Conference & Expo: Register Today! In less than two months, pharmacists from across the state will converge on The Woodlands for the 2018 TPA Conference & Expo, July 13–15. Register today to attend this annual event offering dynamic speakers, CE credit, networking opportunities, and more! For those who have already registered, don't forget to book your hotel room as well. The Texas HHSC has published an update to the May 2018 Texas National Drug Code (NDC) to Healthcare Common Procedure Coding System (HCPCS) crosswalk. It’s important to note that inclusion of a HCPCS code on the crosswalk does not guarantee coverage or payment. Utilize the Fee Schedule to confirm that the procedure is payable. Clinician-administered drug (CAD) processing instructions and frequently-asked questions are also available. Attorney General Ken Paxton is leading Texas into a lawsuit against Purdue Pharma for exacerbating the opioid crisis among Texans. In an announcement Tuesday afternoon, Paxton said the state is taking the drug maker to court for misrepresenting the risks of opioid addiction. The AG’s Office says Purdue Pharma fueled "the nation's opioid epidemic by deceptively marketing prescription painkillers," including OxyContin. The historic gains in Texas and the rest of the nation are now slipping away as the uninsured rate starts to rise again, a new national health care report has found. Texas continues to lead the nation in the rate and number of uninsured, according to health statistics. About 4.5 million people in the state are uninsured, including nearly 700,000 children. The FDA will launch a website this week that will publish the names of brand-name drugmakers that have been blocking generic competition by withholding product samples from generic drug companies through safety strategies with the FDA or distribution agreements. The purpose of the website is to find out the cause of the problem, not to shame drugmakers. FDA approved on Wednesday lofexidine hydrochloride for the mitigation of withdrawal symptoms to facilitate abrupt discontinuation of opioids in adults. The agency noted that although the drug may reduce the severity of withdrawal symptoms, it may not prevent them entirely, and it is only approved for treatment for up to 14 days. CMS on Tuesday released a redesigned version of the Drug Spending Dashboards. For the first time, the dashboards include year-over-year information on drug pricing and highlight which manufactures have been increasing their prices. Medicare Part B drug spending was highest for Eylea, Rituxan, and Neulasta, while Part D drug spending was highest for Harvoni, Revlimid and Lantus Solostar in 2016, according to CMS' redesigned Drug Spending Dashboards. Many of the drugs that have seen the highest spending growth are facing or soon will face biosimilar competition. HHS Secretary Alex Azar said the administration is looking at allowing private payers to negotiate reimbursement for Medicare Part B drugs used in hospitals and doctor's offices. "More broadly, the president has called for me to merge Medicare Part B drug payments into Part D, where negotiation has been so successful," he said. As the health care world parsed the president’s newly released “blueprint” to lower drug prices, the overarching insight seemed to be this: The drug industry’s formidable lobbyists had won some key victories, even if they did not escape entirely unscathed. Many proposals were light on detail and will need action by Congress to become real. Last week, two drug companies that jointly sell a blood-cancer drug made a rare decision: to not move forward with changes that would have effectively tripled the cost of a lifesaving medicine for some patients. Most patients take three capsules of Imbruvica a day, at an annual price of $148,000. Fentanyl, a potent opioid already responsible for thousands of deaths nationwide, is increasingly showing up in drugs like cocaine and methamphetamine in California, officials say. Its presence in non-opioids has public health experts worried that California may be staring down a new dimension of the deadly epidemic. Ebola has erupted again in the Democratic Republic of Congo, the country’s ninth outbreak since the virus was discovered there in 1976, and world health officials are moving unusually swiftly to contain the outbreak. Scientists have launched two large studies to test a medical treatment that, if proven effective, could have an enormous impact on the leading cause of death in American hospitals. There's no proven cure for sepsis, which strikes well over 1 million Americans a year and kills more than 700 a day. A large new study that followed thousands of women with early-stage breast cancer for a median of more than five years has found that those treated with Herceptin for only six months did just as well as those who got it for a year — and they suffered fewer side effects. Telehealth's ability to improve acute care programs is well documented, but its potential to boost medication reconciliation and safety processes is largely untested. One U.S. hospital recently decided to use its system-wide telehealth platform to address medication management practices, and the outcome was better than expected. Drug adherence is critical both for patients and also the financial well-being of the health care system, as nonadherence can cost the industry as much as $300 billion annually, according to some estimates. A new report found almost one-half of those with health conditions said they skip their medication sometimes. The number of US children and adolescents who had received prescription drugs in the past 30 days dropped from 24.6% in 1999 to 21.9% in 2014. Pediatric prescriptions for antihistamines, antibiotics and cold medicines declined, but prescriptions for attention-deficit/hyperactivity disorder, asthma and heartburn medications increased. British researchers have developed a molecule that could make the common cold a thing of the past. The molecule blocked viruses that cause the cold and prevented them from taking control of human cells. "A drug like this could be extremely beneficial if given early in infection, and we are working on making a version that could be inhaled, so that it gets to the lungs quickly," said lead researcher Ed Tate. If a new technique reported Monday works in people as well as it does in lab mice, physicians will be able to tell almost immediately if a patient’s immune system is armed and, if it’s not, quickly switch therapies, increase dosages, or just spare patients often-serious side effects. Pharmacy is ripe for disruption. We still use fax machines every day, and pagers are still a "thing" in some institutions. Many of our pharmacy management systems could stand an upgrade, but how do we integrate this technology in a way that makes our workflow better? The Pharmacists Mutual professional liability policy is tailored specifically for you to protect your career. Our goal is to offer peace of mind, and we believe that goes beyond providing only insurance coverage. Apply online today at www.phmic.com or call (800) 247-5930. Disclaimer: Texas Pharmacy Today is a weekly e-newsletter for members of the Texas Pharmacy Association, 3200 Steck Avenue, Suite 370, Austin, TX 78757. According to Texas Government Code 305.027, portions of this material may be considered "legislative advertising." Authorization for its publication is made by Debbie Garza, CEO, Texas Pharmacy Association.